Hi all! Hope this post finds you well. Today, I'm coming to you with a product review. I got the Simple Micellar Cleansing Water in my SoSueMe Goodie Bag. I know the Simple brand, but never got the chance to use it. Main reason is the price of their products - for example €4.49 for 25 cleansing wipes... no, thank you. Water is natural and good for you, so Simple has decided to harness the power of water. Introducing the next generation of cleansing. 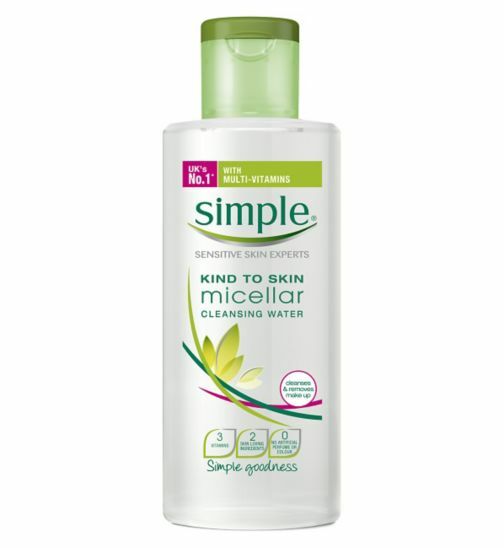 Simple's unique triple-purified Micellar Cleansing Water enriched with minerals and multi-vitamins is especially designed to give the most effective cleanse, whilst hydrating the skin. It actively works to attract make-up and impurities whilst unclogging pores and allowing your skin to breath. Our Micellar Cleansing Water won't leave skin feeling tight, but amazingly clean, refreshed and hydrated. Designed for sensitive skin but loved by all skin types. Effectively cleanse, hydrate and refresh skin. Unclogs pores and allows skin to breathe. I am absolutely amazed by this product. As mentioned above I have used many Micellar waters and so far this is the best one. With L'Oreal, you have to rub a little. Nivea left my skin feel oily and Eveline is just a cheap alternative, but not as good as the rest that I have mentioned. Simple Micellar Cleansing Water left my skin clean and refreshed. It removes make-up like a charm. One move and my eye make-up is removed. It doesn't leave the skin tight. You don't have to rub. The micellar water costs €5.99. I have to admit, that I will not buy it at the regular price, however if a promotion or an offer comes up, I will definitely buy it again because as I said before, it is one of the best Micellar Water available on the market. What do you ladies think? What is your favourite make-up remover?